Tags: Disc and Low back pain. Low back pain is by far the most common thing we see in clinic at Fairway.Physio. 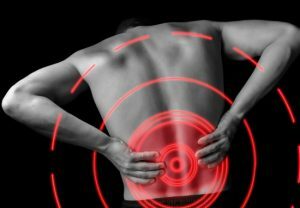 There are many causes of low back pain, but one problem that is commonly known as “a slipped disc” is frequently seen in every physio clinic worldwide. A “slipped disc” is probably a misleading term as the disc does not actually slip anywhere, but is in fact attached firmly to the vertebra above and below it. The condition is also commonly termed as a disc bulge or prolapse but to understand what happens with disc related back pain, we must learn a little more about its structure and function. Vertebral discs are made of a tough outer fibrous cartilage known as the Annulus fibrosus and have a soft jelly like centre known as the Nucleus pulposus. Like the vertebrae themselves, vertebral discs also increase in size as the spine descends to manage the load held above it. Each discs’ main purpose is to act like a shock absorber for the spine and facilitate the movement of each vertebra. Think of each disc acting like a small balloon between each vertebrae. As you bend forward, the front of the disc compresses and the back of the disc expands. If you lean to the right, the disc will compress through the right side and expand on the left. This is normal disc function. Within younger age groups (< 45yrs), the lumbar discs are plump and full of fluid. As we age, the discs tend to dehydrate and reduce in height. A plump disc is more likely to bulge due to the increased intradiscal pressure when full of fluid and therefore we tend to see this type of low back pain in younger people although not exclusively. Picture a bulging disc bulge like a weakened part of an old inner tube or balloon. If it is squeezed in such a way, the weaker part of the disc / balloon will bulge through its weakened area. This weakening of a disc happens either due to prolonged stresses placed upon it or by heavy trauma i.e a poorly positioned heavy lift or sneeze. Therefore, people who adopt bent over postures for long periods of time i/e sitting (particularly slump sitting) / driving or other forward bend positions will compress the front of the disc and expand the back of the disc causing a prolonged stretch / stress to the back of the cartilage (annulus fibrosus). When the back of the disc becomes weakened, the disc bulge and potentially associated pain that can come with this may occur. Low back pain that is associated to a lumbar disc bulge is a treatable problem. The sufferer should avoid bent over postures while their pain persists and try to remain as mobile as pain allows. Regular short walks on a flat surface are recommended for this. Heat packs or rubs can often help with pain and muscle spasm too. Pain killers may also help and allow you to become more mobile therefore facilitating rehabilitation. Most importantly, the sufferer should seek medical advice. Physiotherapists are experts in treating this condition. At Fairway.Physio, we treat disc related LBP almost on a daily basis with a combination of hands-on therapy and exercise based therapy. This combination of treatments is crucial to ensuring a speedy return to full activity and preventing frequent recurrence of symptoms.